I can’t believe that Makers for Fashion Revolution (#makersforfashrev) is in it’s fourth year! What started out as a little post on Instagram that I hoped might encourage a few makers to consider the impact of making their own clothes on the environment and society on a broader level, has become a movement. The hashtag now has over 5000 posts and is a treasure trove of inspiring and thought-provoking posts. In all the excitement of releasing the Darlow pants, I forgot to let you know that I just released a new pattern in collaboration with Peppermint Magazine. 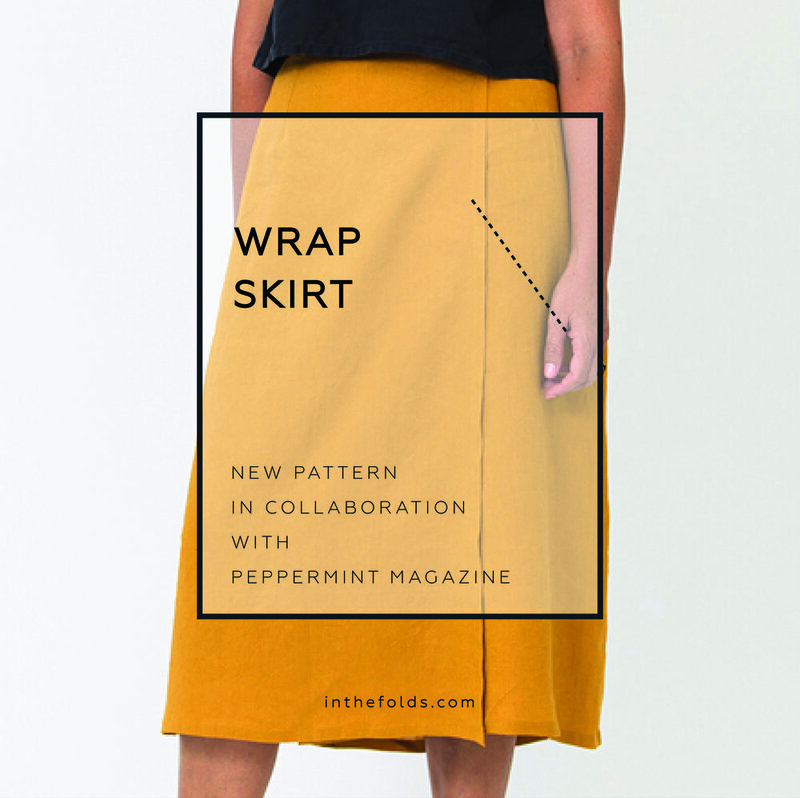 So I am popping in today to introduce you to the Wrap skirt! I have a feeling that this one is going to be really popular, as it’s a quick and easy sew for makers of all levels. And, as always, it’s available for free downloaded. The Darlow pants pattern is finally here! I am ecstatic to be here today to release my newest pattern! I know I say this every time, but this has been a very long time in the works. The Darlow pants were designed in their first incarnation when I was in my final year of university, back in 2011! I was experimenting with the way panels could wrap around the body and could subvert the shapes and details of traditional clothing shapes. I am one of those people (and I’m almost certain that a lot of you are too) that goes into reflective mode as the year draws to a close. I often wish I had the foresight and the hindsight that I have at the end of the year on a more regular basis (maybe monthly? Even quarterly would be nice! ), but it seems that there is just something about the end of one year and the start of the other that makes us see things through a different lens. Both 2017 and 2018 ended in somewhat similar ways. I barely took a break during the year and ended up feeling completely depleted of energy, inspiration and willpower by the time November rolled around. But then I did something that I felt I just had to do and these things gave me more energy and inspiration than I could imagine and got me through the final bit of the year. Yay! A new pattern is here and I am really excited to share it with you! This pattern is another one to add to the collection that I have released in collaboration with Peppermint Magazine. As always, the pattern can be downloaded for free! I really loved designing this pattern. It’s cute, fun and quite a simple sew (and getting the fit right isn’t too tricky due to the loose nature of the design and the tie-up straps). In the Folds just turned three! Happy Friday lovely sewing friends! I wanted to write a little post today about a big milestone I just reached, as I think it’s really important to celebrate when we can, right? Running a business is a hard slog and I think it’s good to stop and take stock for a moment sometimes. Especially when the milestone is an anniversary for your business! This past week marks three years since I started In the Folds. Yay! 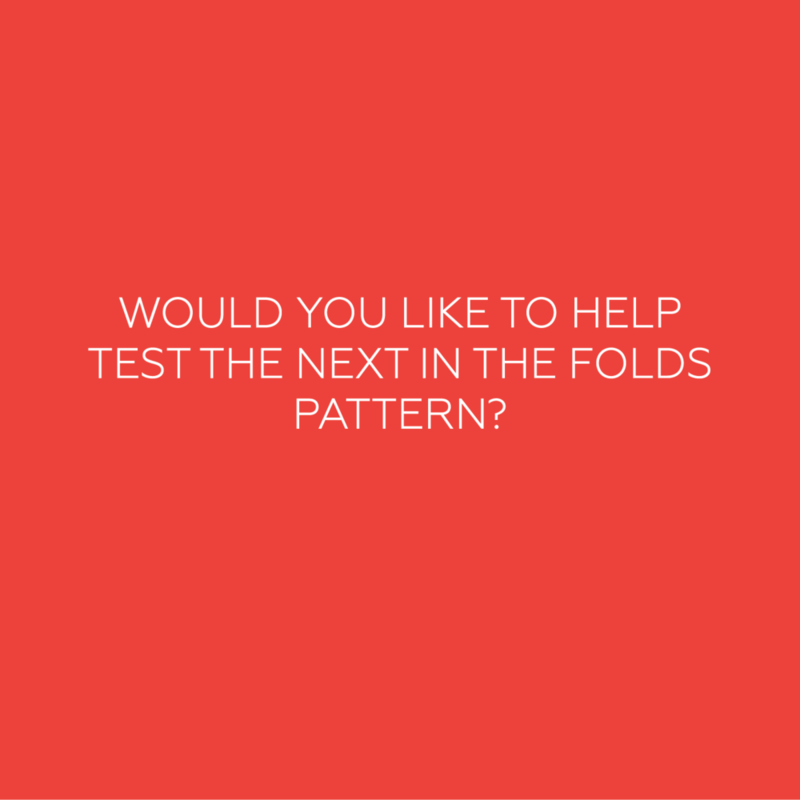 WOULD YOU LIKE TO PATERN TEST FOR IN THE FOLDS? This poor little blog has been neglected of late. When I started In the Folds, I had the high hope of blogging regularly and consistently. I enjoy writing and I enjoy sharing my knowledge, so blogging has always felt like a good fit for me (I have had multiple blogs of different formats and styles over the last decade). I started off strong - posting a multitude of blog posts about sewing, pattern making and even a few behind the scenes style posts. So it has been sad for me to accept that there is just not enough hours in the day for me to blog at the pace I would like to. With drafting patterns (both for my business and my collaboration with Peppermint Magazine), all the administration that is involved in running a business, as well as my part-time job, there just isn’t time for it, which is why the only thing I seem to be blogging about lately is pattern testing! So I apologise in advance if you were hoping for new content and realised that it’s just another call for pattern testers! Although I am sure that a lot of you who missed out last time might be excited to see that there is an opportunity to get involved this time. IT'S PATTERN TESTING TIME AGAIN! I'm so excited to announce that I'm FINALLY ready to test my next pattern! It has been a very long time since I've released a new pattern under the name In the Folds (rather than the patterns I release each quarter in collaboration with Peppermint Magazine) and I'm eager to share it with you all (you may have seen a few sneak peeks over the last couple of months on Instagram). It's that time again! Time to release another pattern in collaboration with Peppermint Magazine! As you probably know by now, each quarter I release a pattern with Peppermint that you can download from their website for free. Printed sewing patterns are almost here! If you follow me on Instagram you will might have seen that I've been working on getting my patterns into print. It's a really exciting time for me and this little business and I am looking forward to sharing it all with you! I'll give you a few details in this post, but I look forward to doing some more behind the scenes style posts in the new year! Yay! New pattern time! With the warmer weather here (at least here in Sydney), it's time for you to see the new pattern I made in collaboration with Peppermint Magazine for their most recent issue. I absolutely loved making this sample - I got to use a beautiful blush linen from The Fabric Store, and it was fun to make something a little more advanced than the things I've been sewing lately. You probably know by now that each quarter I make a pattern in collaboration with Peppermint Magazine. So far I have made six - the Jersey Dress (basically a doona in dress form, particularly useful for those of you in the Northern hemisphere who are about to go into the cooler months), the Peplum Top (this one has to be the most sewn pattern I've made by a long shot! ), the Beach Cover-up, the Vintage-style Skirt, the Slouchy Cardiand the latest edition that was just released in the recent issue is the Jumpsuit. Today we have made it to the final post in the Collins Top Sew-along! For a full round-up of all the posts in the series, you can have a look here. I must say it is a huge relief to be done. Although this time I received a lot of help with it, by having someone take the photos for me (fin out more about that here), it is still a huge amount of work to put a sew-along together. In today's post, we'll be finishing of View B (the sleeveless version) by sewing the button in place and hand tacking the all-in-one facing in place (in my opinion, when it comes to clothing there is nothing more annoying than a facing that keeps flipping up from the inside of the garment). Hem time! Yay! 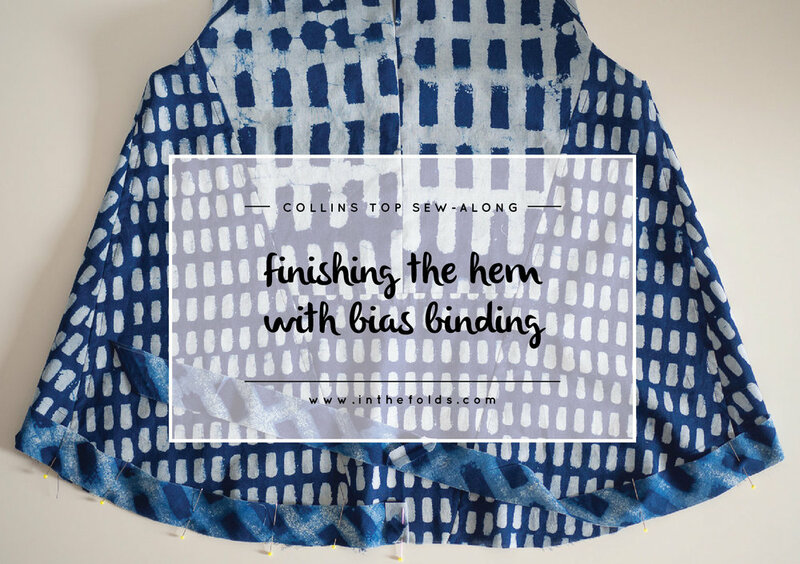 If you would like to bind the hem on your Collins Top, then keep following this tutorial. If you would prefer a simple double folded hem, then head over to this tutorial for more guidance. Welcome back to the Collins Top Sew-along, today we're working on my favourite element of the sleeveless version of the Collins Top - the all-in-one facing. It is sure to give you a really beautiful and clean finish, as well as leave you feeling pretty chuffed with your skills! While doing the sew-along for the Collins Top, I thought it would be a good opportunity to show you how to make a hand-stitched button loop. Although the instructions of the Collins Top call for a bias cut button loop (the tutorial for making that can be found here), a hand stitched button loop could be a beautiful alternative, if you find you've got the time, or would just like a lovely little detail (or even just to learn a new skill)! This tutorial will guide you through making a button loop for the Collins Top, but could be used for any pattern that includes a button loop. I hope you have been enjoying the Collins Top Sew-along over the past couple of weeks. So far, we've covered pattern alterations and sewing View A (sleeve version). Now, it's time to get started on View B (the sleeveless version). If you are making View B of the Collins Top (the sleeveless version), you need to assemble the main body pieces in the same way as you would if you were making View A (sleeve version). For a tutorial on how to do this, check out this tutorial. Once you have assembled the front and back of the top, you will need to attach the shoulder panels. So today we'll be finishing up View A (the sleeved version) of the Collins Top in the Collins Top Sew-along. Yay! We'll be hemming the body of the top and the sleeves as well as sewing the button in place. And then you'll be ready to wear your beautiful new top! The Collins Top sew-along is now in full swing! We're coming towards the end of the posts for View A (the version with sleeves) and today we're up to binding the neckline. I really love a bound neckline. It gives you a lovely clean finish, whilst also giving you a chance to add a nice personal touch (like Saki - the sew-along photographer - did with her version, which you'll see in this post). Today, in the Collins Top Sew-along, it's time to make the button loop for the centre back closure. You will need the button loop for both versions of the Collins Top. I'm interrupting the Collins Top sew-along today to show you how to sew a bias bound seam. Why? Because they are beautiful! And the centre back seam in the Collins Top, gives you the perfect opportunity to use bias binding to get a really clean, beautiful and professional looking finish. Bias bound seams can be used in a range of different garment, and work particularly nicely in a garment that you are likely to see the inside of. Yay! It's time to start sewing! Last week, I kicked off the Collins Top sew-along with a handful of pattern adjustment posts, so you can feel confident that you can make a beautifully fitting top. Now it's time to work on the sewing, so that we can have a beautifully finished top too! Whether you are making the Collins Top View A or View B, the process starts the same way. You will assemble the front of the top, then the back and then the process will change, depending on whether you are making your top sleeveless or with sleeves. So, to kick off the sewing part of the Collins Top Sew-along, we'll be starting by assembling the body of the top. Introducing Saki - Sew-along photographer and all-round awesome maker! Today's post is a little bit different and a little bit special! You may have seen that late last year I put a post on the blog looking for an illustrator and photographer to help with my workload. A number of people applied for both positions and I was lucky enough to find an illustrator to help me with the illustrations for my pattern instructions, who I have now been working with for over six months (and you would have seen her work if you have used any of my recent patterns). I found someone that I thought could take the sew-along photographs, but when it fell through soon after, I balked. I just couldn't get my head around how I would be able to pass this job onto someone else. It all just became too overwhelming to cope with. I accepted that I'd just have to keep doing it myself (and maybe just find someone to assist me). I am interrupting the Collins Top sew-along with a little treat that can help you get planning! As you may have noticed, the Collins Top includes a lot of panels! I really love playing with panels during my design process (as you probably have noticed if you have used any of my patterns). I think they provide an opportunity to create simple shapes with interesting details. Over the last couple of days I have shown you how to perform a Full Bust Adjustment (FBA) on the Collins Top to start off the Collins Top sew-along. The process is a little different to what you might be used to, due to the fact that the top doesn't have a dart or bust shaping through a panel and it also has a panel line. You can find the tutorial here (this tutorial guides you through the process of creating a bust dart in the centre front panel). If you would like to know how to make the adjustment without the dart, then take a look at this tutorial (you will need to create the dart and then redistribute the fullness of the dart to the hemline). In today's post, I'd like to show you how to re-draft the front facing piece. By making changes to the centre front panel and the side front panel of the Collins Top, the original front facing will no longer fit the pattern. You will only need to do this if you are making View B of the Collins Top (the sleeveless version) and have made a Full Bust Adjustment. In yesterday's post, I showed you how to do a Full Bust Adjustment (FBA) on the Collins Top pattern to start off the Collins Top Sew-along. The process is a little different to a usual FBA because of the panel line in the front piece, as well as the lack of dart or bust shaping in the pattern. In yesterday's tutorial I showed you how to add a dart to the centre front panel of the Collins Top to get some extra width across the bust, if your bust measurement is larger than the B cup In the Folds patterns are drafted for. In today's post, I want to show you how to remove that dart, if you would prefer to keep the pattern dartless. Yay! It's time to start the Sew-along for the Collins Top! This has been a long time coming. I had high hopes for this sew-along being ready as soon as the pattern was released, but unfortunately it didn't work out that way. I decided to release the Collins Top the week before #makersforfashrev and two weeks before an overseas trip and so that is what caused the delay (sometimes my planning skills leave a bit to be desired!). If you have been following my blog for a little while, you'll proabbly know that a sew-along for me is a pretty big deal. I really like to jam pack in as many posts as possible, to ensure that if you are following along, all your questions get answered and I can help you make a garment that you really love and fits you well. You may remember that the Acton sew-along had a whopping 24 posts in it! It is a lot of work to do, but as a lot of the content can be applied to many other different patterns, I feel it is a worthy mission. I want to help makers be the best makers they can be and I feel this is a great way to help! Yay! It's that time again! Time for me to show you the new pattern I made in collaboration with Peppermint Magazine! Are you joining me for #makersforfashrev? Last year I had all these grand ideas for what I wanted to do for Fashion Revolution Week. As is the case with a lot of my grand plans, I realised that I had left it too late and there was far too much to do for me to get it happening in time. So I went for second best (or what I thought was second best at the time) and decided to run a little Instagram photo challenge. I have seen a lot of them run very successfully, and I knew it was a good way to spread the word and raise the profile of an issue, so I quickly made some daily prompts and put it on Instagram with the hashtag '#makersforfashrev' to let people know what it was all about. I am so excited to be here telling you all that my new pattern is here! Meet the Collins Top - a loose-fitting trapeze-shaped top designed for woven fabrics. The Collins top is It is A-line in shape, perfect for hot summer days. It features a round neck, panel lines, a high-low hem and a centre-back opening, with a button and loop closure.The Collins top is It is A-line in shape, perfect for hot summer days. It features a round neck, panel lines, a high-low hem and a centre-back opening, with a button and loop closure. As I celebrate finally making it to the week in which I will release my new pattern - the Collins Top, I can't help but become a little reflective, thinking about the process, the lessons learned, the challenges overcome and the skills gained. If you asked me a year and a half ago, when I started In the Folds, where I would be now, I would have told you that I would have had a truckload of patterns in my Pattern Shop by now. Oh how naive I was! And thankfully I was that naive. If I knew how much time, blood, sweat and tears would go into creating just three sewing patterns, I probably would have run the other way. Thankfully, all I had for a reference were the amazing women in the indie sewing scene that are producing patterns, and they seemed to be able to churn out 4-6 patterns per year, so why couldn't I?